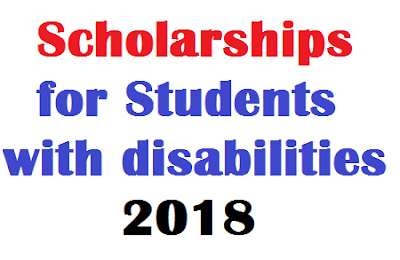 Scholarship for Students with disabilities 2018- Department of Empowerment of Persons with Disabilities has been implementing Scholarship for Students with disabilities schemes to give educational opportunities the students with disabilities. The scholarship for students with disabilities has been started at the official website www.scholarships.gov.in. The eligible students can apply for this scholarship before the last date which is described below in this post. Scholarships for Top Class Education for students with disabilities. For this Scholarship, the students have to submit the online application at official portal of National Scholarship. The students with more than 40% disability and family annual income of parents or guardian not more than Rs. 2.50 Lakhs from all sources are only applicable for this Pre-Matric Scholarship. For this Scholarship, the students have to submit online application at official portal of National Scholarship. The students with more than 40% disability and family annual income of parents or guardian not more than Rs. 2.50 Lakhs from all sources are only applicable for this Post -Matric Scholarship. For this Scholarship, the students have to submit an online application at official portal of National Scholarship. The students with more than 40% disability and family annual income of parents or guardian not more than Rs. 6 Lakhs from all sources are only applicable for this Post -Matric Scholarship. For more details please visit the official website of National Scholarship Portal: www.scholarships.gov.in. Note: Please Read carefully the official notification before applying for above-mentioned scholarship schemes. Please visit regularly for more updates for scholarship and many more. I hope you like this post very much and please share this post with your friends through the social media.